A root canal or endodontic therapy, the tooth’s infected pulp, nerves, and blood supply are removed due to disease, trauma, or infection. After the pulpal tissue is removed, it is then cleaned, disinfected, and filled with gutta-percha, a biocompatible rubber-like material that helps prevent future infection and pain. A root canal is a common form of treatment to save teeth otherwise that may need extraction. What does a Tooth Consist of? A normally developed tooth has three layers: enamel, dentin, and pulp. Enamel is the hard layer you see when you smile. The dentin is a thin layer underneath the enamel. And the pulp is the innermost layer, consisting of live tissues and nerve in a “canal” shaped space, and fed nutrients via the blood supply from the heart. 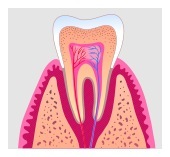 Why does a Tooth need a Root Canal? bacterial invasion, the pulp of the tooth needs to be removed and cleaned out. Where the nerve and tissues once were, there is now a space beneath the dentin and in the roots that need to be filled. This once occupied canal space by the pulp is cleaned and shaped with fine instruments and medications. Once this space is sufficiently cleaned and shaped, it is then filled with a material called gutta percha along with a sealer to make sure the gutta percha is sealed. A root canal is also known as an endodontic procedure. The act of removing the nerve and filling the canal space is in essence a root canal. The dentist uses thin stainless steel nickel titantium files and filaments via rotary instrument to remove the nerve and living pulp tissues. Periodically during treatment, the dentist may take x-rays to measure and confirm the fit of the fine instruments and gutta percha. The treatment is usually painless as the tooth is first numbed with local anesthetic. There are rare cases where the nerve is extremely inflamed and angry (i.e. called irreversible pulpitis); in these cases the pulp may be very difficult to numb as the angry nerve tissue actually counteracts and limits the effect of the local anesthesia (i.e. harder to get numb). Cases likes these are rare, and can usually be well managed with different anesthesia techniques. So rest assured the typical root canal treatment is fairly straightforward using various methods. In fact, many of my patients have actually fallen asleep in the chair! Your dentist can discuss with you if the root canal can be performed at the office, or if the treatment needs to be done by an endondontist (a specialist dentist who does only root canal treatments). Endodontists are highly trained to treat teeth that may have very thin or curved roots, or teeth that may require re-treatment due to recurrent infection. What Happens After a Root Canal is Done? After completion a crown is usually then placed to restore the tooth to full form and function, especially on posterior premolars and molars to prevent tooth cusp fracture and breakage. In some cases a filling will function as well. Your dentist will discuss with you the appropriate restorative treatment, go over post-operative instructions, and prescribe any medicament as needed. If you have any questions about root canal treatment call us today at (425) 614-1600.